PT Asuransi BRI Life – BRI Life is a reputable national life insurance company in Indonesia. BRI Life engaged in life insurance, sharia life insurance and pension funds of financial institutions (DPLK). The Company was first established in 1987 and initially registered as PT Asuransi Jiwa BRIngin Jiwa Sejahtera. The name of PT Asuransi BRI Life officially established in 2017. PT Asuransi BRI Life is a life insurance subsidiary company of state-owned lender PT Bank Rakyat Indonesia (Persero) Tbk (BRI Group). As of December 2017, BRI Group holds 91.001% shares in BRI Life. Other 8.999% remaining shares in BRI Life was owned by Yayasan Kesejahteraan Pekerja Bank Rakyat Indonesia (YKPBRI). 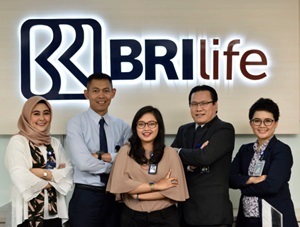 Headquartered in Jakarta, BRI Life runs its business through 33 conventional sales offices and 11 sharia sales offices spread in all over Indonesia. BRI Life’s head office is registered at Graha Irama. Jl HR Rasuna Said Blok X-1 Kav 1 – 2, Kota Jakarta Selatan, DKI Jakarta 12950. In term of financial positions, BRI Life managed to recorded good performance in the business year of 2017. According to information found in PT Asuransi BRI Life Annual Report 2017 as cited by JobsCDC.com, BRI Life booked total premium income (net) of Rp3.80 trillion in 2017 or increased by 25.45% from Rp3.03 trillion in 2016. BRI Life’s total net profit in 2017 increased by 53.36% from Rp214.02 billion in 2016 to Rp328.22 billion in 2017. Total assets increased by 32.16% in 2017 from Rp6.18 trillion in 2016 to Rp8.16 trillion in 2017. Minimum D3 in any field. Less than 1 year of experience in financial industry or have experience outside in financial industry or fresh graduate candidates. Minimum 1 year of experience in insurance or banking industry. Minimum 2 years of experience as Sales or Marketing. Minimum 2 years of experience as Sales or Marketing in Banking/Financial industry. Have achievements in achieving targets.